Sen. John Kerry (D-MA) is becoming obsessed with Alaska Gov. Sarah Palin. inserting her name into political story lines for no apparent reason. For the second time in less than a month, former presidential candidate John Kerry (D-MA) has decided to throw himself -- unbidden -- into the Sarah Palin waters. Last month, just as the Mark Sanford "missing governor" storyline was just beginning to gain traction, Kerry mocked at a party, "Too bad if a governor had to go missing, it couldn't have been the governor of Alaska. You know, Sarah Palin." That's Mr. Subtle Hilarity: For those that didn't quite get the punchline, he had to remind people who the governor of Alaska is (Yeah, that's a fair question now -- with the resignation and everything -- but it wasn't then.) Of course, the irony is that when the Sanford story finally unfolded, the story of the South Carolina governor stepping out on his wife brought back some unfortunate memories of Kerry's former running mate from North Carolina. In any event, Kerry felt compelled to re-enter the Palin fray once again this week. The governor wrote a The Washington Post op-ed Tuesday on climate change and the pending cap-and-trade Senate bill. Now, it's fair to say that the governor's reputation on just about any issue has taken quite a beating over the last two weeks. A CBS poll this week suggests that her abrupt resignation has finally damaged her even with strongly partisan Republicans. Only 33 percent now believe she's qualified to be president. So why does John Kerry feel the need to rush to the online arms of The Huffington Post to run a rebuttal of Palin's op-ed? Talk about preaching to the choir! At least give Palin some credit for running her piece in what could be considered unfriendly territory: The Washington Post isn't exactly a conservative stronghold. But Kerry needs to use a recognized liberal site to launch cheap jokes like, "Governor Palin need no look further than the view from her front porch in Alaska to see how destructive this crisis can be"? Ha-ha! Cute allusion to the Tina Fey line that Palin can "see Russia from my house." 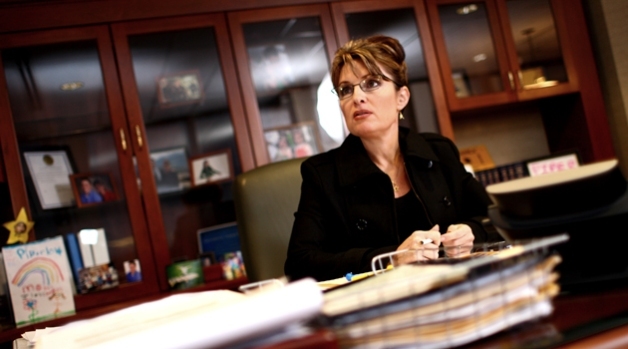 Does Kerry really think Palin is such a threat that she needs to be countered immediately? Perhaps the good senator from Massachusetts should recall that age-old political advice: Don't get in the way of an opponent when they're in the middle of imploding.